Hound breeds under the American Kennel Club (AKC) fall under two categories – Scent Hound and Sight Hounds. Scent Hounds include dog breeds like the Basset Hound, Bloodhound, and Foxhound. 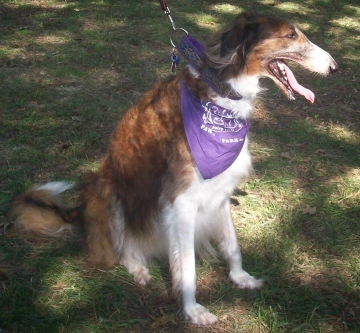 Sight Hounds include dog breeds like the Greyhound, Afghan Hound, and Borzoi. All sight hounds originated from southwestern Asia. Although the Borzoi dog breed is considered a Russian dog breed, he was probably developed by mixing breeds like the Saluki and Greyhound with Russian sheepdogs and/or Russian Laika dog breeds. Borzoi is derived from the Russian word for ‘fast’. And the Borzoi dog breed is fast – fast enough to outrun wolves. As such, the Borzoi dog breed was often used for hunting (or coursing) wolves. The Borzoi did not kill the wolf; he and one or two of his companions only held him down until the human hunter caught up. The Borzoi dog breed, also called a Russian Wolfhound, was primarily used by Russian aristocrats. He was used for actual hunting or for organized hunting sport events. Because the Borzoi dog breed was associated with the nobility, he almost became extinct after the Russian Revolution (1860s) where his kind were systematically killed. Thankfully, this noble breed was saved by foreign nobility. He gained popularity in the US by being seen with film’s early celebrities such as Jean Harlow and Jacqueline Gadson. Point of interest, Boris in the Disney movie, Lady and the Tramp, is a Borzoi. Because of his hunting background, the Borzoi dog breed tends to chase small animals. He may not do well with cats or small dogs. Due to his independent nature he may not get along with other sized dogs either. However, this can be overcome with proper socialization at a young age. The Borzoi dog breed may also not do well with children and he is reserved with strangers. But the Borzoi dog breed is otherwise amiable, moderately playful, and somewhat affectionate. He is generally quiet indoors but energetic outdoors. Although he does not require a lot of exercise, he does need regular walks and a good run once a week. The Borzoi dog breed is a large dog standing at an average of 26-31 inches tall and weighing 65-105 pounds. This size range is an average – the Borzoi dog breed can be larger. He has a long narrow head and muzzle, his skull somewhat rounded, and he has small folded ears. His coat, which can be any color, is long and silky and can be flat, wavy, or curly. The Borzoi dog breed sheds a lot so he needs to be brushed 2-3 times a week. He has a deep narrow chest. His feet are hare-like, great for running at high speeds. And he has a long tail carried low and slightly curved. Purebred dogs are more disposed to have genetic health issues. However, the genetic health issues of the Borzoi dog breed are relatively few. Like many big dog breeds with deep chests, the Borzoi dog breed is prone to gastric torsion. Gastric torsion is where the stomach bloats and twists. If left untreated, gastric torsion can lead to death. The Borzoi dog breed is also inclined to have heart problems. A good breeder will have proof that heart tests have been completed. If you are looking for a generally quiet dog who only needs moderate exercise, the Borzoi dog breed may be for you. Be prepared to keep him well brushed and be sure that he is socialized at a young age so that he gets along well with other pets. Use positive reinforcement methods for training, as the Borzoi dog breed tends to be a little sensitive to harsher training methods. The Borzoi dog breed can be somewhat aloof, but he is overall a very good-natured dog. As your dog ages, it is a great idea to start thinking more about his kidney health. The kidneys act like filters, taking waste products and toxins out of the blood and other bodily fluids. Kidney problems cause toxins to build up in your dog’s blood, which can lead to a variety of other health problems for your pooch. 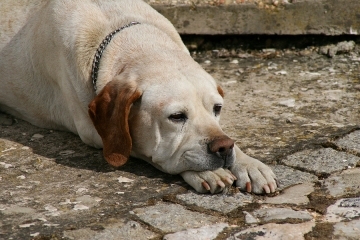 Chronic canine kidney disease is generally seen in older dogs, however dogs of any age can get canine kidney disease. Watch your dog for the following symptoms. If you suspect that your dog may be having trouble with his kidneys, make an appointment with your vet immediately to discuss treatment options, including diet, medication and supplements like Azodyl. Dogs with canine kidney disease may begin to urinate more frequently and to produce more diluted urine as kidney function decreases. This increase in urination leads to dehydration, so you may also notice your four-legged friend drinking a lot more water than he used to. If you start to notice your dog getting tired on walks or not having the energy to play like a puppy, it could be due to muscle weakness caused by kidney disease. Canine kidney disease can also cause loss of appetite and nausea. Bad breath, diarrhea and shivering can also be signs of canine kidney disease. Your veterinarian can help you make a plan to treat your best friend’s kidney trouble. Damaged caused by canine kidney disease is not often reversible as your dog ages, so it is important to take these symptoms seriously. Keep an eye on your pet’s health and he will love you for years to come. If you thought the 167 AKC dog breeds was a lot, consider the number of other dog breeds around the world. 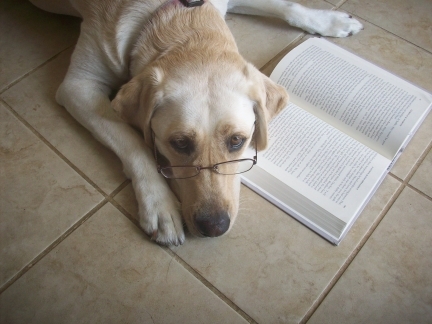 We are expanding our knowledge of dogs to dog breeds of the world and would like to share what we have learned with you. 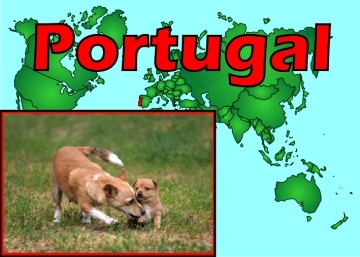 We have recently been studying the Podengo Portugueso Medio and Podengo Portugueso Pequeño, also known as the Portuguese Hound. As you may have guessed by the name Portugueso, these dogs are dog breeds of Portugal. The Podengo Portugueso Medio is the medium sized version and the Podengo Portugueso Pequeño is the small sized version of the Podengo Portugueso Grande. The Podengo Grande is very rare but the Medio and Pequeño are very common in Portugal. The Podengo Portugueso dog breeds may have ancestry from the Pharaoh Hound and/or descended from the small Iberian wolves. The Pharaoh Hound has origins in the Middle East and could have easily been brought to areas around the Mediterranean by the Phoenicians and Carthaginians. The Podengo more closely resembles the Pharaoh Hound but there are differences. For one, the Pharaoh Hound does not come in a wirehaired version like the Podengo does. And the Pharaoh Hound does not come in a smaller version. The Podengo Portugueso Medio and Pequeño can be yellow, tan, or black. He can be the solid color or the color with white. His hair can be short or he can have wire hair. Like the Pharaoh Hound, he has tall triangular ears, a thin build, and a lean face. His face is not quite as long as that of the Pharaoh Hound, but the resemblance is striking. Although the Podengo Portugueso Pequeño strongly resembles a Chihuahua, he is not at all related. The Podengo Portugueso Medio was and still is used as a small game hunter in the rural parts of northern Portugal. The Pequeño was used for flushing small game but he is mostly now a popular house pet in the urban areas of Portugal. The Pequeño is relatively easy to train, gets along well with children, and does well with children. The Medio, on the other hand, is still very much a working dog and may not do as well in city life. To learn more about the Podengo Portugueso Medio and Podengo Portugueso Pequeño, check out The New Encyclopedia of the Dog by Dr. Bruce Fogle. Ever heard of Etsy.com? It is a website for individual craftsmen to display and sell their wares. If you are looking for hand-crafted art for yourself or as a gift, this is the place to visit. One craftsman we found had some great dog themed woodcraft art. His name is Jon Fine from Mays Landing in southern New Jersey. Check out the above product and more at his Etsy website – http://Jonpsu77.etsy.com. We love the above piece as well as one called “Dog miniature wooden desk clock”, “A Spoilt Dog Live Here wood mug holder”, “The Dog Lady wood display”, “I Love My Lab wood sign” and other dog breed wood signs. Jon is 55 years old, happily married with two grown sons, and has a pit bull and three cats. The quality of his dog themed woodcraft art makes it obvious that he is an animal lover. 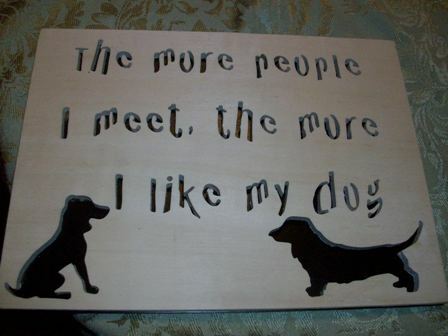 Jon’s dog themed woodcraft art is a unique gift for anyone who loves dogs. And his work is reasonably priced. If you like his work but want something a little different, just ask! He is more than eager to help make you the perfect gift. Contact him and find out more at his Etsy website http://Jonpsu77.etsy.com. Etsy is safe and secure and full of quality craftsmen like Jon. Dexter’s Ruff Life is back, this time with a Valentine’s love song. Dexter is a cute little Yorkie who loves to entertain. Enjoy the Valentine’s video and Happy Valentine’s Day! We found the best homemade dog treat recipes for Valentine’s Day at www.best-dog-treat-recipes.com. Make chocolate-like dog cookies with carob instead of chocolate and it is safe for your dog. The above dog cookie is made with carob, frosted with yogurt and sprinkled with soy bacon bits. 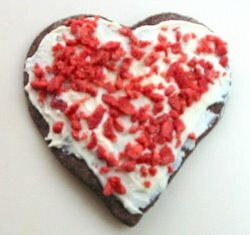 Get the recipe at http://www.best-dog-treat-recipes.com and have a Happy Valentine’s Day! Maya now knows how to play dead. It was super easy to teach her. It took about 5 minutes a day for less than 15 days. It was really difficult at first so I stopped the moment I got her to do it at least once. But after the 10th day, she caught on pretty well. We perfected it on the days after and now she does it almost every time. The book, “101 Dog Tricks” by Kyra Sundance and Chalcy, say that the prerequisite for learning this trick is stay and rollover. Maya knows stay, but not rollover. It’s actually difficult to teach her rollover since we have mostly hardwood floors and it hurts her back. Perhaps we will try it in the spring. Despite not having the rollover trick down, Maya learned play dead easily because she loves tummy rubs. In fact, I did not use treats as her reward for doing this trick. A tummy rub was the perfect reward for her on this one. To teach your dog how to play dead, you can use a the finger point like a gun as your hand signal and the queue “bang!”. I used “play dead” as my queue, but you can use “bang!” or even “boo!”. I also used a different hand signal. Start by putting your dog in the down position. Then kneel in front of him, hold a treat to the side of his head, and move it towards his opposite shoulder. You can help him a little but don’t push him. Once he is on his back, give him the treat, tell him what a good dog he is, and rub his tummy. Once he gets this down, do it standing and hold off on the treat and tell him to stay. Make his stay until you give the release command, “okay!”, then give him his treat. Maya is not quite to this point yet. I may not take it to this level as I love to give her the tummy rubs. Sephi knows this trick already. She won’t go on her back, but she will stay until I give the release command. Taylor this trick to you and your dog’s preference. And learn more fun tricks from “101 Dog Tricks” by Kyra Sundance and Chalcy. It’s that time of year again! If you’re like me and not interested in football but love dogs, then this show is perfect for you. Puppy Bowl VII is on Animal Planet on Sunday, February 6th at 3pm Easter/Pacific time. This is the Puppy Bowl’s 7th year. It was popular the first year, but it is even more popular now. Other things to see are the Puppy Touchdowns, Unnecessary Ruff-Ruff-Ruffness, Pre-Game Show, and Kitty Half-time Show. Meet the Puppy Bowl VII Starting Line-up which includes adoptable puppies like Jessie, a Shepherd mix, Little Red, a Shih-Tzu/Beagle mix, Molly, a Boxer mix, and Calvin, a Border Terrier mix. Check it out and enjoy your Super Puppy Bowl Sunday! The Australian Shepherd dog breed as we know him today is considered a US dog breed. His ancestors came from Europe, relocated to Australia, then found their way to California. So if the Australian Shepherd dog breed came from Europe, why is he considered to have origins in the United States? And why is he called an Australian Shepherd? He is probably considered a US dog breed because his breed was perfected in the US. And he is probably considered an Australian Shepherd because that is what the people in California called his predecessors. The dogs which originally came to California from Europe and Australia were mixed breeds, possibly Kelpie and/or Scottish Border Collie mix. And they were probably also mixed with yet other breeds which later gave us the standard breed which we call Australian Shepherd. As a result of the mix of various herding breeds across the world, the Australian Shepherd dog breed is a hardy breed with exceptional herding skills. He can withstand the hot temperatures of Australia as easily as the colder weather of Europe. His herding skills are diverse – sheep, cattle, you name it, he can herd it. The Australian Shepherd dog breed is also good at hunting and tracking. He is very intelligent and easy to train so he has also been used as a messenger dog in World War II, to perform tricks at rodeos and on film, and for search and rescue. The Australian Shepherd dog breed never tires. The high energy of the Australian Shepherd dog breed makes him great at herding and other skills, but sometimes not so great at being a house dog. If he does not get enough exercise and mental stimulation, he can develop bad behaviors such as getting into things, chewing, jumping the fence, and running off. If you plan on getting an Australian Shepherd dog breed, be prepared to provide him with a very active lifestyle. He is highly energetic and playful so play with him plenty and give him some stimulating dog toys such as a Buster Food Cube. Also take him on some strenuous walks or runs every day. While the Australian Shepherd dog breed can be independent in nature, he is affectionate and eager to please. He can get along well with other pets but he may try to herd smaller pets. He is both gentle and patient with children, but he may also be inclined to herd small children. He is bold, alert, and wary of strangers so the Australian Shepherd is a natural watchdog. The Australian Shepherd dog breed can be interesting in color. He can be black or red with white, and sometimes have tan markings. Or he can be blue merle (pictured above) or red merle, also with white and possible tan markings. His eyes can be brown, amber, or blue, or flecked with any combination of those colors. He has short hair around his face, ears, and front feet but the rest of his coat is medium in length, either straight or wavy. His top coat is water resistant and his undercoat is thick. This double coat requires brushing at least twice weekly. The Australian Shepherd dog breed stands about 18-23 inches high and can weigh 40-65 pounds. He has triangular ears set high on the head and folded forward or to the side. And the tail of an Australian Shepherd dog breed is either docked or naturally bobbed. He has broad feet which are oval in shape. His muzzle and head are equal and moderate in length. And he has a straight and level back. If you are considering purchasing an Australian Shepherd dog breed, be sure to research the breeder thoroughly. The Australian Shepherd dog breed is prone to a number of hereditary diseases which are more common in dogs bred by irresponsible breeders. Common hereditary diseases of the Australian Shepherd dog breed include cataracts, collie eye anomaly, nasal solar dermatitis, Pelger-Huet syndrome, hip dysplasia, and ivermectin sensitivity. Many of these diseases can be and should be tested for by the breeder. 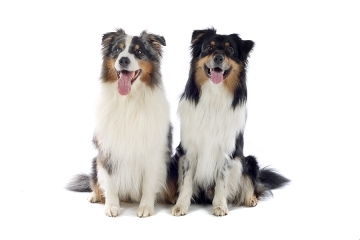 The Australian Shepherd dog breed is perfect for a family with an active lifestyle. He can be a great playmate for your older children, would love to go running or follow you on your bicycle, loves to play fetch, enjoys learning new tricks, and just loves to be loved. To find the perfect dog for your family, research for a good breeder, visit an animal shelter, or contact an Australian Sheepdog rescue group.